University of Georgia Press, 9780820344164, 254pp. In the popular imagination, the twenty years after World War II are associated with simpler, happier, more family-focused living. We think of stereotypical baby boom families like the Cleavers--white, suburban, and well on their way to middle-class affluence. For these couples and their children, a happy, stable family life provided an antidote to the anxieties and uncertainties of the emerging nuclear age. 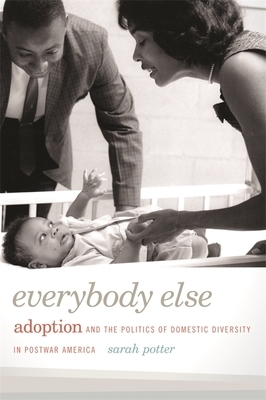 Everybody Else provides a comparative analysis of diverse postwar families and examines the lives and case records of men and women who applied to adopt or provide pre-adoptive foster care in the 1940s and 1950s. It considers an array of individuals--both black and white, middle and working class--who found themselves on the margins of a social world that privileged family membership. These couples wanted adoptive and foster children in order to achieve a sense of personal mission and meaning, as well as a deeper feeling of belonging to their communities. But their quest for parenthood also highlighted the many inequities of that era. These individuals' experiences seeking children reveal that the baby boom family was about much more than "togetherness" or a quiet house in the suburbs; it also shaped people's ideas about the promises and perils of getting ahead in postwar America.